Make aliquots (5 uL) of the T4 Ligase Buffer so as to not continuously repeat freeze-thaw cycles. USE FROM ALIQUOTS FROM NOW ON - NOT THE GREEN-CAPPED EPPENDORF. 1. Remove inoculation tubes from inoculation (37C shaker). 2. Obtain P1 buffer from 4C refrigerator. 3. Take centrifuge tubes and add 1.5mL of inoculated cells. 4. Centrifuge at 3000 rpm (low) for 1-2 min. 5. Spin until white pellet of cells forms at the bottom and liquid is more clear. 6. Take off supernatant and discard. 8. Resuspend pelleted bacterial cells in 250սL P1 buffer. 10. Add 350սL buffer N3 and immediately invert 4-6 times. 11. Centrifuge for 10 min. at 13,000 rpm. 12. Take supernatant and add to spin columns. 13. Spin 30-60 sec. and discard flow through. 14. Wash column with 750սL buffer PE and centrifuge 1 min. 15. Discard flow through and centrifuge and additional minute. 16. Please column into a clean 1.5mL microcentrifuge tube. 17. Elute DNA by adding 30սL dH2O. 18. Let stand for 1 min., then centrifuge for 1 min. We found that we had extra left over. 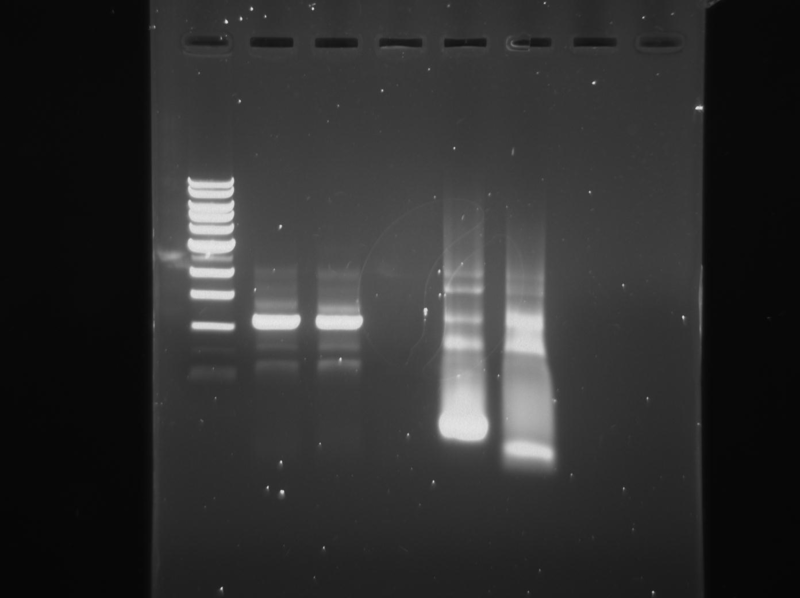 Once PCR is finished, run 4 uL of the reaction on the gel. Check for a band running at a size of 393+81=474 bp, so approximately mid 400-500 bp. If band is observed, prepare for the digest (check for the RE sites based on what primers were used). Steps in BOLD are going to be repeated with each plasmid construct. Steps A,B, and C have already been done for each building block and won’t be repeated unless there is a specific issue with a particular building block. Steps K and L do not necessarily need to wait until step J is completed to be run. They are listed this way so there is no confusion about what is being digested or PCR purified at each step. 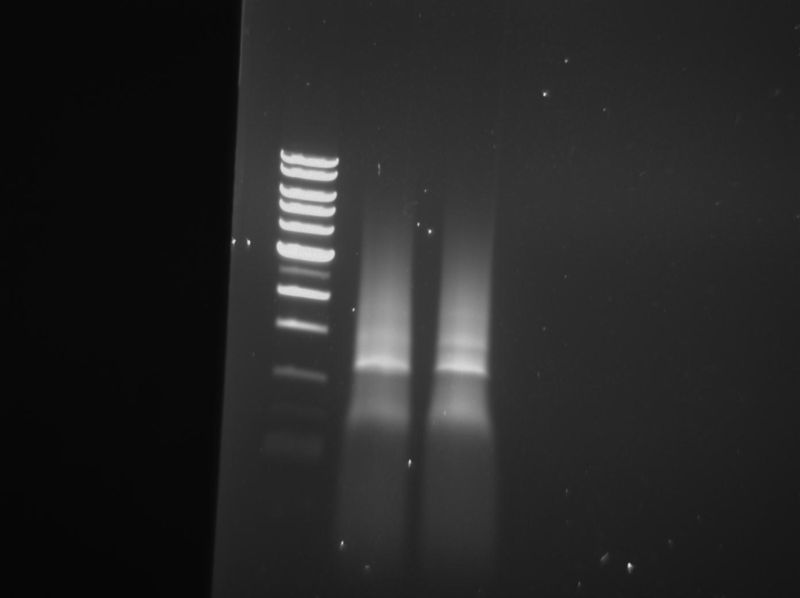 The gel picture of the hybB+ompa is in the folder. The band is bright at 500 bp, and our predictions confirm the results. 1. Make cryostocks of mRFP:NB cells from starter cultures made on 9/27/2010. 900uL cells+100uL DMSO. Stored in -80C fridge in Gaucher Lab (iGEM box). Christina+Rob PCR purified the hyb+ompa PCR. For the constructs that have Aox+RFP, we can do a ligation of Aox to RFP; then, PCR that part and ligate it to the Hyb+ompa. PCR ended at 3- Scott and Christina will grab them. Picked colonies from plates of HybB+RFP and added to 25 ul of water each. Used 5 ul for PCR, and added 250 ul of LB media to the rest. These tubes are in a green holder in the 37 degrees incubator. 10 tubes in Block B. Should end at 5 pm. 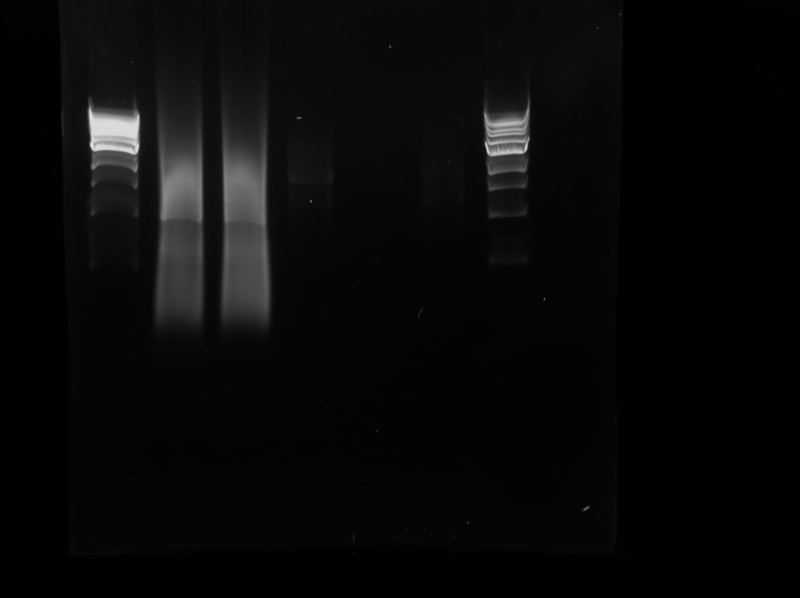 First 5 tubes are from plate 1, and the -10 are from plate 2. Wrote details in Scott’s notebook. Ran out of GOTAQ enzymed for tube 10. 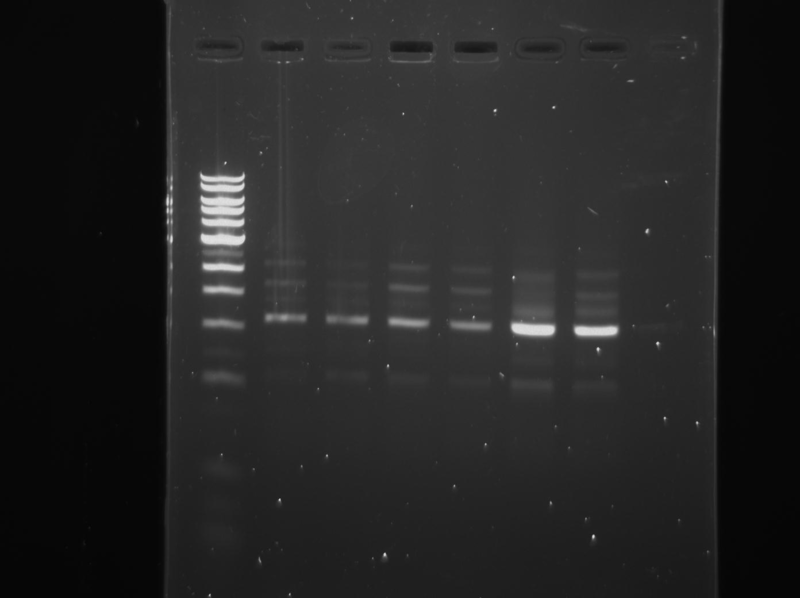 Got some from Ryan for this specific PCR, but still ran out =/ So tube 10 may have funky results. leave in 4C overnight.labelled with an “A” on top. leave in 4C overnight - labelled with a “B” on top. Plates from 9/29/2010 of the hyb+rfp construct have many red colonies. Each colony has a red center and brownish outer ring surrounding that center. I put the plates in the refrigerator. The pcrs of Aoxa/b+RFP do not appear clean. The predicted 1700 bp is very faint. We need to troubleshoot! Ask Richard/Megan volume for triple ligation. Do we need to check concentration of ligations? I have laid out the proposed double ligation recipes, but check with Richard/Megan. I predict the triple ligations are similar except less water will be used . 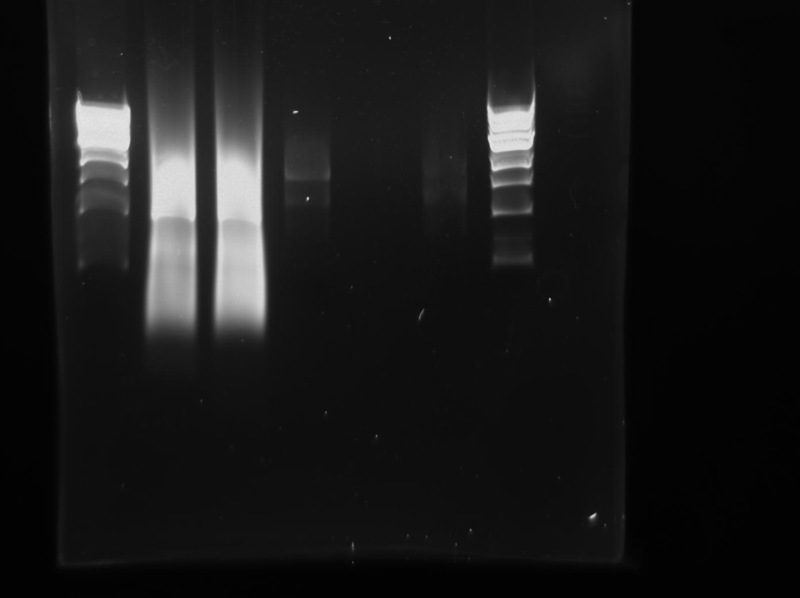 What is our plan- do digests from the ligations, or PCR them up and then digest? Inconclusive- the predicted bands do not appear. Make sequence files for all constructs! 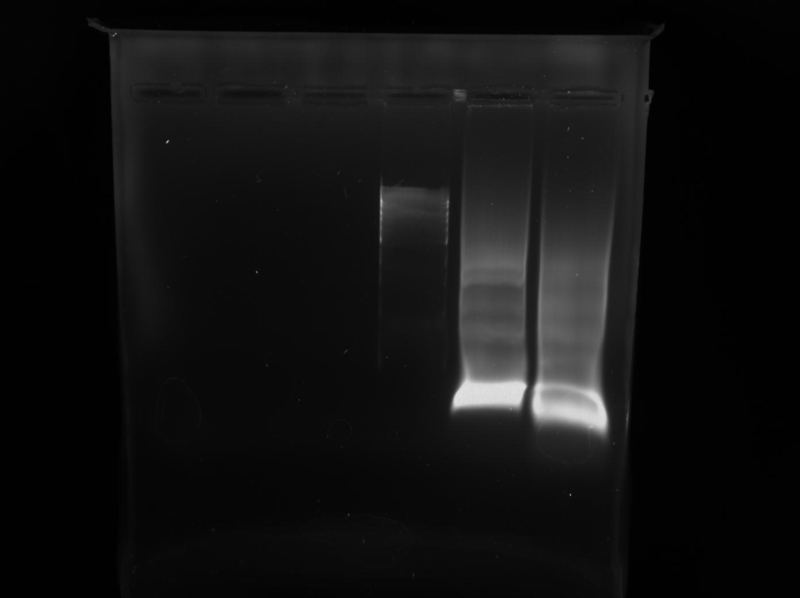 For Mitesh, Margo: I ran wrong PCR- Run on gel the PCR labeled from 9.30.2010 as “Repeat” with Christian’s name on it. 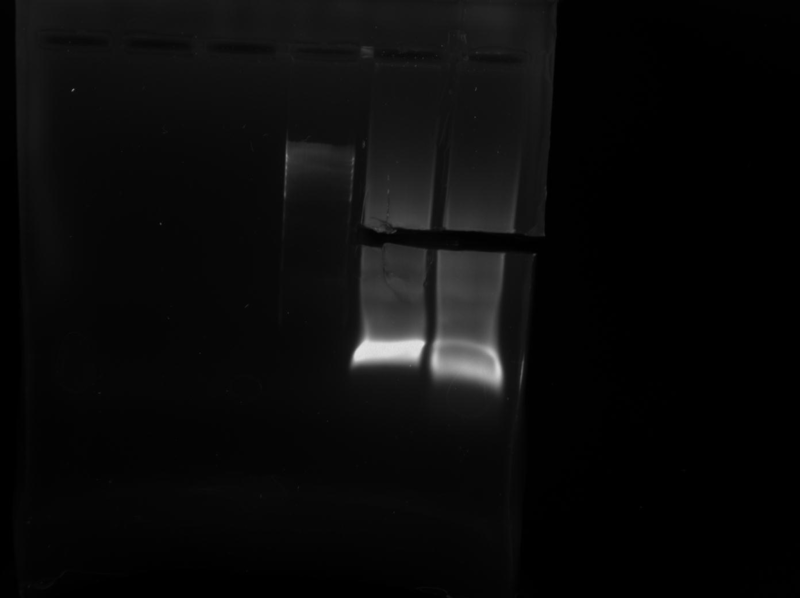 Gel extraction has two bands- one is the 1700 one we want, the other isn’t. We need to plan how get the 1700 one; perhaps another gel extract? We need annotated sequence files-Richard has some starting ones. Dr. Gaucher suggested doing a PCR purification of the Ligation reactions, since PCR is sensitive to salts and buffers. Also a gradient would be useful. Try increasign annealing temp to 56 or so, 52 is too low he said! Do we start from the digested products we have or start from scratch? Culture1 has a slight pink hue, while culture 2 does not; the rest have pink hues less than that of culture 1. Well 3 (the empty one) should not be empty! Perhaps misloaded?